SUMMARY: Audio Fox Wireless TV Speakers are a great addition to any household who has a family member with hearing issues who likes to watch television at a high volume. 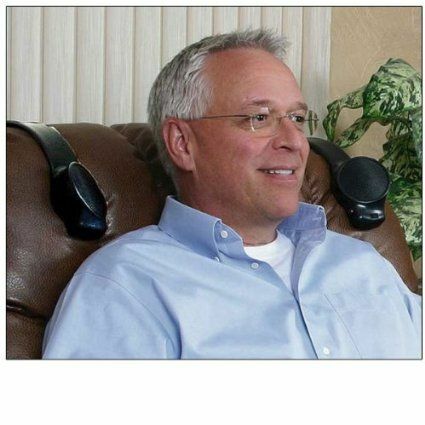 This distinctively designed TV watching system will restore peace and allow the hard of hearing to control the volume of the speakers that are placed around his or her head, while others in the room will able to watch television at a reasonable volume level. They are slightly more expensive than some of the other products available, but they are one of best options for people who are hard of hearing who want to watch television without disturbing others, especially for those who don’t want to wear headphones. PROS: Easy to set up and use. They do not take up space on a chair or side table. The two speaker design is comfortable for most people. You can avoid the isolation or discomfort of using headphones. The speakers are plugged into an electrical outlet, so you don’t have to worry about batteries wearing out. They are made in America. CONS: Some users may have a problem with the device slipping off the furniture it is attached to. The setup instruction could be improved. The Audio Fox Wireless speakers are a uniquely designed personal speaker for anyone with hearing problems. 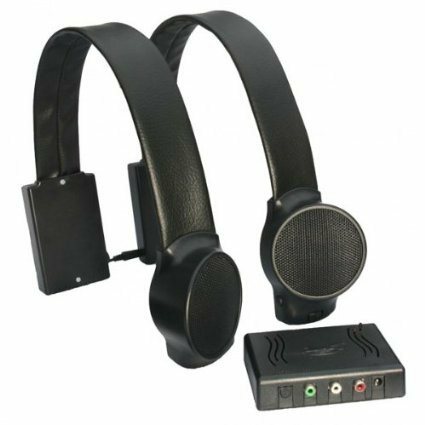 What makes this product different than other devices to help the hard of hearing watch television, is that it comes with two small speakers that attach to your sofa, recliner or bed. The sound from the tv then goes almost directly to the listener’s ears. This design avoids some of the discomforts of having to wear headphones or having to find a place for a larger portable speaker. This system works well for people who use hearing aids but are still having trouble hearing the television. It also works well for others who don’t use hearing aids but would like a bit of extra audio enhancement to help clarify speech and sound while also cutting down on background noise. It allows the person using the system to listen to the television at a higher volume than other people in the room. The sound quality is crisp and clear on the Audio Fox. Since the speakers are so close to the listener’s ears, the user doesn’t have to crank up the volume as they might if they are using a device that is farther away, so you don’t run into the ‘fuzzy’ sound that can occur when the volume is too high. You cannot set the volume for each speaker separately; there is only one volume knob that controls both units. There is a mute button that will mute both speakers so you can answer the phone or speak to others in the room. The audio from the television is transmitted wirelessly via FM waves to two speakers near the listener even when the TV is in the mute mode. If you would like the option of having the room completely silent (for example if one person wants to read in silence), the Audio Fox comes with a headphone jack so you can listen to the television via the speakers through headphones. The two major competitors to the Audio Fox are the television Ears Wireless TV Headset and the Sennheiser Wireless TV Headphones, both of which use headsets. Headsets are an excellent option for some, but others find that they are just not comfortable or they find them too isolating. There are other wireless speakers such as the TV SoundBox Wireless Speaker or the TV Ear Wireless speaker that you would place beside you, but the Audio Fox can be positioned much closer to your ears. As far as having a comfortable device, this is a great option. Families where one member watches TV late at night and doesn’t want to disturb anyone. Anyone hard of hearing who watches television at an elevated level. Family members of people who are hard of hearing who would like to watch TV at an average level. People who don’t like wearing headphones while watching television, but who still need a TV hearing aid. The design of the Audio Fox is really what makes them stand out. These are meant primarily for people with hearing issues, to allow them to have speakers set up on each side of their head with a volume control independent of the television volume. The basic design is two wireless stereo speakers are attached to vinyl wrapped steel straps that you place the back of your chair, bed, or couch. The hearing impaired user can control the volume for Audio Fox while the non-hearing impaired people in the room can control the TV volume by using the remote. The speakers need to be plugged in a wall socket to work; this avoids the problem of having to recharge batteries. To change the volume, you rotate the dial to turn it up or down. The volume control and mute button are mounted on the speaker next to your head. The receivers look kind of like giant headphones that you attach those to your couch or chair, and then you connect the transmitter box to the back of your TV. The sound travels from the television to the receiver using a wireless transmitter which plugs into your TV. The unit is available in the colors black, brown, gray or tan, so it should be able to blend in with most furniture. For the most part, the set up for this product should be pretty straight forward. If you have a complex TV set up, you may run into some difficulties getting the system to work, but generally, you should be able to plug the transmitter easily into the back of your television using the applicable audio port and necessary cables that come with the device. The Audio Fox couldn’t be easier to use; you change the volume to suit your preferences and mute the sound if you need to stop the sound for whatever reason. This device comes with a one year warranty and 30-day money back guarantee. By most accounts, the company that makes Audio Fox speakers, Sound Product Solutions, have a great customer service department. They honor the warranty and the money back guarantee. They will also help if you run into issues with the device. You can contact them at 1-888-553-7898 for assistance.